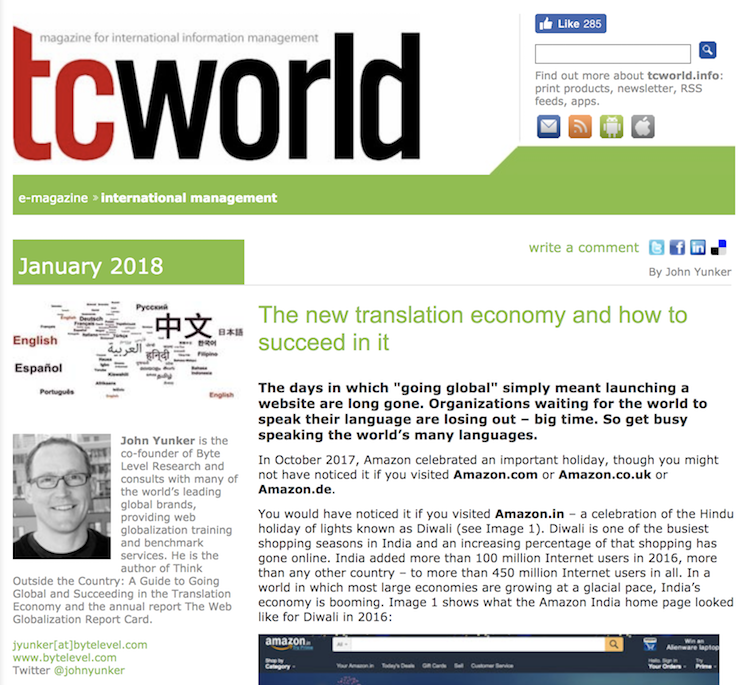 Here is an article I wrote that was recently published in tcworld magazine. In it, I define the “translation economy” and the opportunities (and challenges) it presents to all organizations. The internet connected the world’s computers, and the digitization of content enabled the rapid flow of information around the world, which drove several decades of what came to be known as the information economy. But one of the great myths of the information economy – and the World Wide Web, for that matter – was the idea that a company could go global simply by launching a website. While the Internet connects computers, it is language that connects people, and the information economy has for too many years exhibited an English-language bias. And for much more on the translation economy, check out Think Outside the Country. Also now available in Japanese!